Third-party beer sampling agencies improve the experience for marketers and retailers. 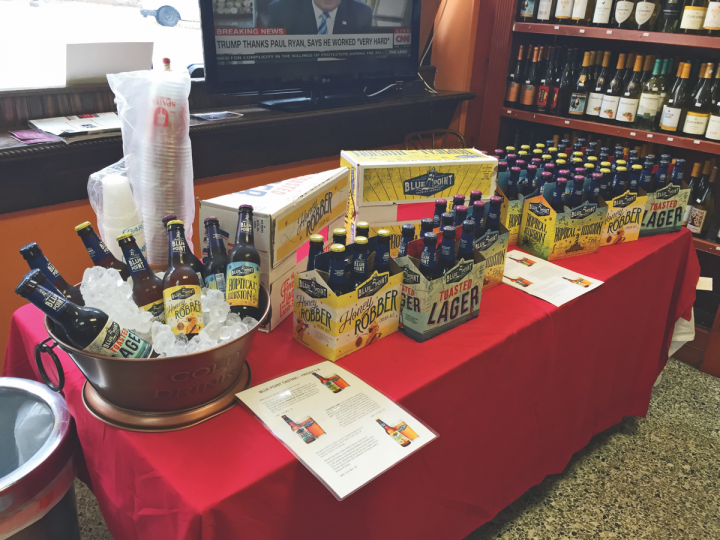 ExperTaste Marketing (Blue Point Brewery sampling table pictured) arranges in-store sampling events for brewers and provides them with detailed data on consumer buying habits as well. Many retailers have hosted brand ambassadors to lead in-store beer tastings—only to find that some know little about the products and engage poorly with customers. But poor experiences may become a thing of the past, thanks to the emergence of professional pouring agencies. “Suppliers can pay professional models $50 an hour and get nothing in return,” says Nolan Rodman, vice president of Rodman’s Discount Food & Drug, which has three locations in the Washington, D.C. market. “Professional pourers, however, can help drive sales of their featured product.” For tastings at his stores, Rodman’s has opted to partner solely with ExperTaste Marketing, an agency that arranges beer sampling events and also shares results and analysis with suppliers and retailers. “We do samplings all the time—for food, wine, soap—and ExperTaste is the first company I’ve seen that collects data and shares it with the retailer,” Rodman says. Washington, D.C.-based ExperTaste was founded four years ago by beer industry veteran Orest Mryszuk, who spotted an ideal business opportunity. “There were plenty of modeling agencies handling sampling events, but we felt there was a need for reliability, reporting, and product knowledge,” he says. Today ExperTaste works with more than 200 professional pourers from Maine to South Carolina. All of them have completed the Brewers Association’s Beer 101 online course, which gives them access to ExperTaste’s digital product library for brand-specific details. Data collected at each sampling event includes consumer demographics and customers’ product ratings, based on a five-star system. ExperTaste represents about 80 beer suppliers, and it poured at some 3,000 events in 2017, mostly at off-premise venues. This year the company expects to be involved in 10,000 events as it doubles its number of professional pourers. Another sampling agency, Fort Worth, Texas-based Pourtastic Tastings, also provides brand ambassadors and detailed event reporting to beer marketers. Co-founder Amber Rynbrandt and her partners formed the company in 2013 after witnessing “so many frustrated retailers when pourers didn’t show up or weren’t knowledgeable about the product.” Pourtastic operates in ten states—including California and New York, with plans to enter Florida soon—and works with up to 250 professional pourers. Many of them are bartenders or homebrewers, and all must pass a brand knowledge test before being hired. Pourtastic’s event reports include estimated sales data, geographic analysis, consumer demographics, and any other products purchased during the event.